This conclusion chapter offers a summary of key contributions of each chapter, gathering the main conceptual approaches and major issues of the case studies presented in the volume. A recurring theme is the importance of quality interpretation for visitors and tourism businesses in the wildlife tourism sector. As readers will have noted, the chapters encompass a range of wildlife topics to varied audiences to convey information, a sense of wonder and concern for conservation. 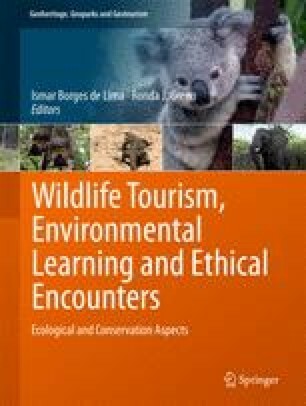 The authors have sought to present their topics bias-free by balancing ecological and anthropocentric views, but the welfare and conservation of wildlife used as tourism attractions, whether captive, semi-captive or in the wild, has been of major concern. Ethical and moral issues pervade the discussions on human-animal encounters, particularly in situations where wildlife has apparently been over-exploited for entertaining visitors. While extreme cases such as obvious abuses of animal welfare and practices that threatened endangered species are easy to condemn, the debates are often not so easy to resolve with the simple answers that many hope for. Emotions are often high when pros and cons of various tourism operations are discussed, but there remains much that we do not know about pressures on the ecological needs of wildlife and the seriousness of stress imposed on individual animals. Much further research related to some of the impasses and deadlocks related to wildlife tourism planning and management would be valuable for future publications. For example, some argue that the 'end of zoos' should become a future reality, or that zoos should be replaced by sanctuaries, while others point to valuable work by zoos supporting conservation, caring for rescued wildlife, educating the public and conducting research. There will also be many readers who will be uncomfortable with the chapter on hunting, while others will maintain that although we must remain vigilant on the welfare and conservation implications, without hunters many areas that retain most of their natural attributes would never have been protected and may not remain protected into the future if all hunting is banned. Management of both animals and people is crucial to truly sustainable wildlife tourism, to mediate the interaction with wildlife in tourism contexts and incorporate compassionate and conservation-based ideology. Integration of different disciplines is essential, which may be a novel approach for many and call for innovative goals, research and management plans.